It’s a fact that people who are suffering from these ailments agree that it is not just the physical effects of their complaint that troubles them, it is psychological effects. Creams, cover-up make-up, sun avoidance and medicine may help for some people. But now the light shines – and that is LED light therapy. A way to control skin complaints. Clinically proven to trigger your body’s natural cell production to accelerate skin repair, LED light therapy is a safe, non-invasive treatment which uses certain wavelengths of light (colours). Light is absorbed by the body as a source of energy to activate the body’s specific natural cellular repair functions including cellular rejuvenation for scars and wrinkles, bacterial & fungal infections and anti-inflammation. The sun has healing properties, but it comes with the downside of side effects due to the harmful UVA and UVB rays. LED light therapy is what is called a narrow band, non-thermal energy which induces the same healing qualities, in a controlled manner. This means that the harmful ultraviolet rays (invisible to the eye) are blocked, avoiding sun damage and possible long term exposure leading to skin cancer. Low levels of this beneficial light energy from the light spectrum energise cellular functions to stimulate various cellular processes. LED light therapy produces a natural response, similar to photosynthesis in plants (using light to synthesise nutrients). Different colour wavelengths are used to treat different skin conditions, for example blue light is used for active acne as it combats the bacteria responsible, it is also very effective for psoriasis, dermatitis and eczema and has anti-inflammatory quality. Red light can enhance collagen and elastin production and yellow light is very effective for evening out ski tone. 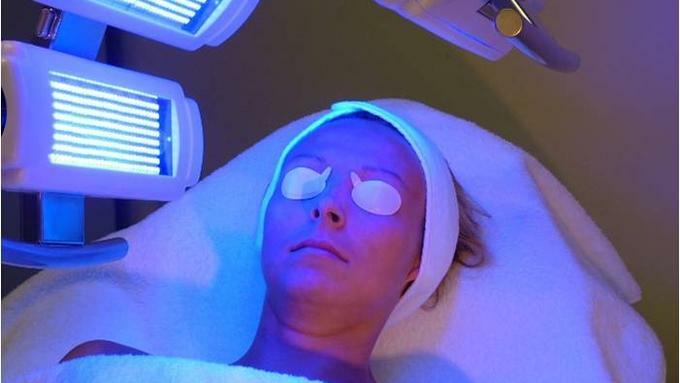 LED light therapy may be used to control skin complaints, but is also particularly effective used in conjunction with other laser treatments such as skin rejuvenation (wrinkle reduction, brown spots etc.) and tattoo removal to aid the healing process. Relaxed. The treatment is under a lamp, you lay down, put the goggles on and most people normally fall asleep. How long will it be before I see a result? This depends on the severity of the condition being treated. Six to eight treatments, one week apart are normally recommended to see a satisfactory result.